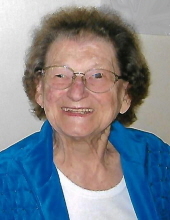 Helen Wojcikiewicz, 93, of New Cumberland, passed away peacefully surrounded by her family on Monday evening, April 8, 2019 in Messiah Lifeways, Mechanicsburg. She is fondly remembered as a loving wife, mother, grandmother and great grandmother. Her family and especially her grandchildren and great grandchildren meant everything to her. A member of St. Theresa Parish, New Cumberland, her interests and service included CCW, Ladies Bowling League, Nearly New Shop and St Theresa School. She was a member of American Legion Post 143 Auxiliary and a Holy Spirit Hospital volunteer. Born in Plymouth, PA to the late Alex Sr. and Katherine ([Cypilla] Sypylok) Bouika, she was preceded in death by three brothers, and her husband, Leo S. Wojcikiewicz. Prior to marriage, Helen served as a bookkeeper for construction, automotive and municipal services. She is survived by three daughters, Kathleen Jewett (Michael) of Frederick, Maryland, Lynnmarie Bennett (Michael) of New Cumberland and Theresa Ann Sherman (Michael) of Fairfax Station, Virginia; ten grandsons, one granddaughter, three great grandsons, two great granddaughters and numerous nieces and nephews. Mass of Christian Burial will be celebrated at 11 am on Tuesday, April 16, 2019 at St. Theresa Catholic Church, 1300 Bridge St. New Cumberland, PA with the Rev. J. Michael McFadden as Celebrant. Viewing will be from 9:30-10:30 am Tuesday in Parthemore Funeral Home & Cremation Services, New Cumberland. Burial will be in Gate of Heaven Cemetery, Mechanicsburg. The family wishes to express appreciation to Homeland Hospice and Messiah Lifeways’ Wagner and Engle Neighborhoods for their loving care and support for Helen. In lieu of flowers, the family respectfully requests memorial contributions in Helen’s memory to her church at the address above. To send messages of condolence to Helen’s family or for driving directions, please visit www.Parthemore.com . To send flowers or a remembrance gift to the family of Helen Wojcikiewicz, please visit our Tribute Store. "Email Address" would like to share the life celebration of Helen Wojcikiewicz. Click on the "link" to go to share a favorite memory or leave a condolence message for the family.